Hot Cocoa! It brings warm memories of snow days, winter play, and the cozy moments after the chill – enjoying a hot cup filled to the brim! Try this creamy, chocolatey, healthier immune-boosting version – you AND the kids will enjoy! Promise! This hot cocoa brings together powerful herbs with yummy chocolate to create a delicious remedy to keep you well during the winter months. You can also purchase any organic powdered mushroom blend or use a single mushroom powder, like Reishi in this recipe. Medicinal mushrooms are powerful adaptagens. They help the nervous system by reducing stress, increasing focus and optimizing energy. They also improve immunity to help the body resist cold and flu virus, as well as upper respiratory infections. They are amazing herbs which help support a healthy immune system. Everyone loves Chocolate! Did you know in its raw cocoa form, it also contains antioxidants, balances cholesterol levels, relieves depression, lowers blood pressure, and even helps to manage obesity! Enjoy! And stay well this Winter! 1. Whisk together the milk, hot chocolate powder, and mushroom powder. 2. Heat in a saucepan on low-medium heat until just about to simmer. 3. Remove from heat. Pour in blender and add two dates. Blend until thick and creamy. 4. Pour the hot cocoa into cups and sprinkle chocolate on top. Elecampane Honey Cough Syrup in 8 Easy Steps! The root of Elecampane is a powerful medicine. This spring has burst into warm sunny days, bright cheery blooms, and best of all, early plants to forage and eat. Highly nutritious and full of vitamins and minerals, early edibles will give you a burst of energy and vitality, and are a great way to enjoy a taste of spring! There are plenty of edible plants available during spring in the Northeast. My favorite early plants appear in the same place on my farm in Chadds Ford, Pennsylvania every year. Today I gathered chickweed, ramps, and nettles and created this Spring-Foraged Herb Tart. I also added the spinach I planted last fall which was ready to pick now. Powerful Punch in a Tart! You can find real nourishment in nature. A walk or hike will invigorate your soul. Gather ingredients from nature for food, and you can powerfully nourish your body! Chickweed, Stellaria media, is easily identified by it’s white star-like flowers. It’s a low growing plant which thrives in sun or shade. I usually find it in undisturbed areas; along a wall or tucked under a tree. Look closely, it has tiny hairs on the stems and at the end of flower buds. The leaves are oval with pointed tips. This plant is an easy one to find. I found it growing under the parking meter I used in town today! (Please note, urban foraging can be exposed to environmental toxins. Choose your plants wisely!) It’s a nutritious addition to any salad or sandwich. It has vitamin A, B and C, as well as minerals including calcium, copper, magnesium, potassium, iron, manganese, silicon and zinc. Nettles, Urtica dioica is a common naturalized weed throughout North America. You may know it as “Stinging Nettle” …. which tells you a lot. You can identify it by touching it with bare hands – Which I do NOT recommend! It’s tiny hairs act like needles in the skin. Use gloves to harvest and handle it carefully until it’s blanched in water – only then is it consumable, and the sting is gone. It can also be dried and used a tea. Nettles contain vitamin A,B,C,E,F,K,P, as well as multiple minerals and high levels of antioxidants. It is literally a natural multivitamin. Ramps, Allium tricoccum is sometimes called a spring onion. It is in the onion family, but they taste more like a garlicky scallion. Yum! The trick is find an area where there is a patch. Once you do, you can go back every year and take just enough to enjoy. Overharvesting can cause your patch to disappear. Not good! Ramps are high in vitamin A, C, selenium and chromium. It is a powerful antioxidant, meaning that it seeks out and neutralizes free radicals, the particles that attack healthy cells and, in unchecked amounts, can bring about premature aging. Ramps in your diet makes you a Spring chicken! Use cold ingredients to make crust. Put the flour and salt into the bowl of a food processor. Add the butter, cut into pieces, pulse for about 10 seconds. Add ice water drop by drop until the dough holds together without being wet or sticky. Turn the dough out onto some plastic wrap. Press the dough into a flat circle. Wrap the dough in the plastic and chill for at least an hour. On a lightly floured board, roll chilled dough out into a 1/8” circle. Place pastry in tart pan, trim edges. Line pastry with aluminum foil, add pie weights, and partially bake unfilled pastry. Preheat oven to 375 degrees F. Bake for 10-15 minutes, or until the pastry begins to color around the edges. Remove foil and weights. Let cool. Bring water to boil in a one-quart pot. Blanch each of the first three ingredients beginning with nettles. Use tongs to avoid sting. Place nettles, in boiling water for about 1 minute. Remove immediately, strain, remove leaves, discard stems. Chop into very small pieces. Do the same with chickweed and ramps (except no need to removes stems); chop everything after removing excess water. Place olive oil in sauté pan, add onion and cook on medium heat for about 2 minutes, until translucent. Add the spinach and stir until wilted, about 1 minute. In a bowl mix 3 eggs, one cup of milk, and 1 teaspoon of salt. Chop two cups of Basket cheese into small pieces. Add the chopped wild greens, sautéed spinach, parmesan and Basket cheeses to the egg mixture. Place egg mixture into cooled tart shell. Bake in a 375 degrees F oven for 45 – 50 minutes, or until the pricked center comes out clean. Allow to set for about 10 minutes before cutting. Serve warm or room temperature. Enjoy! When you think of lavender, maybe you think of those small pillow sachets filled with dried lavender flower seeds. This popular scent keeps drawers and closets from smelling musty. Or…do you just think lavender, the scent? It’s a favorite for many. Well, it’s not just a scent. Lavender is a powerhouse herb that is useful for so much more. Everyone should have it in their home and garden! Lavender’s history alone distinguishes it from other herbs. It has been documented for over 2500 years. It’s use in a variety of forms, has been recorded by Egyptians, Phoenicians, Ancient Grecians, Romans, in Medieval and Renaissance Europe, and across continents here and abroad, for a very long time. The term “lavender” is translated from the Latin “lavare”, meaning “to wash.” Romans used it as perfume, a scent for bath water, an insect repellent, and to flavor foods. In the Bible, it is referred to as “spikenard”, meaning “genuine and pure”. Lavender was the ointment used to anoint Jesus, by his mother, before his death, because it was a valuable fragrance used for special occasions. During Medieval and Renaissance Europe, it was thrown on the floor of castles to deodorize and disinfect. People grew lavender in their gardens because they believed it warded off disease. Lavender played a critical role in the 17th century, during the Great Plague. It was customary to tie lavender to both wrists to ward off ‘Black Death’. Even the thieves during this time were using lavender in a special potion called “Four Thieves Vinegar”. They washed themselves with it after stealing from corpses diseased by the plague, for protection from the disease. They were on to something, because we now know that fleas carried the disease. Lavender, an effective insect repellent, was likely responsible for saving many lives and helping to stop the spread of the deadly virus. The Shakers, a religious group of English Quakers, were the ones who used lavender as a commodity in the U.S. and Canada. They grew it in their gardens, made medicines and various other products. Lavender is ubiquitous today, used as a scent in a variety of cleaning, health, and beauty products. In addition to it’s ability to cleanse and deodorize, it is truly a versatile herbal medicine. It’s proven medicinal properties make it useful as an antiviral, antifungal, antioxidant, analgesic, antibacterial, antidepressant, anti-anxiety, and as a carminative (for gas and bloating). An herbalist can teach you how to use lavender in a salve, a tincture, a gel, or a tea, or even just in the form of an essential oil, as an everyday home remedy. As an essential oil, use it to treat 1st and 2nd degree burns. Lavender essential oil can treat athlete’s foot, cuts, cankers sores and insect bites without diluting it. It can be used to treat gas, nausea, digestive issues, and intestinal viruses. It’s used to address stagnant depression, mild anxiety, and is well known as an herb to improve sleep quality. Lavender has also been effectively used in pain relief for migraine headaches, sprains, joint pain, toothaches, and burns. It can be used to promote menstruation, treat acne, and can be part of a cancer fighting protocol. Lavender can be used both topically and internally and is a wonderful culinary herb. Practically speaking, it should be in every home …but, probably the best reason to grow it is because it looks so beautiful in the garden, and it attracts bees! I’m looking forward to sharing some very specific information about how to use lavender in the home. Look for a workshop soon! "The History of Lavender." The History of Lavender. N.p., n.d. Web. 18 Feb. 2016. "LAVENDER: Uses, Side Effects, Interactions and Warnings - WebMD." WebMD. WebMD, n.d. Web. 16 Feb. 2016. Winston, David. "Class Notes - Lavender." N.p., n.d. Web. Actually, there are more than seven ingredients – but - the key seven ingredients that make this soup “sacred” are plants and herbs mentioned in the Bible. The other wonderful quality about each of these ingredients is that they all lower cholesterol. This hearty soup is delicious, cholesterol-reducing and nutritious. The sacred seven are: Chickpeas, Coriander, Cumin, Tumeric, Garlic, Onion, and Lentils. First boil two cups of chopped butternut squash for about 10 to 15 minutes or until just able to pierce with fork, and still firm. Drain and set aside. Boil the lentils in 4 cups of water for about 15 minutes until soft, set aside. In a large saucepan, on low heat, add all the spices to the olive oil and stir for about 30 seconds. Add the bouillon. Then add and sauté onion and/or leeks with garlic for about two minutes. Add red, and jalapeno peppers and zucchini, sauté for about 4- 5 minutes or just until just soft. In a large soup pot add lentils, sautéed vegetables and vegetable broth and simmer on low heat for about 10 minutes. Then add butternut squash and garbanzo beans and heat through, about another five minutes. Add water if the soup is too thick. Salt and pepper to taste. Serve with fresh chopped cilantro. I definitely have a sweet tooth. So, in an effort to have the occasional healthy sweet treat, I created this recipe. The intent was, no white sugar - but just as sweet and satisfying. I began with the amazingly sweet, and full of nutrition - Medjool dates. My inspiration was the turtle. A gooey, caramely, nutty, chocolatey classic! This is a healthier version but, by no means low in calories. You only need one to satisfy that sweet tooth! Combine first 11 ingredients in a bowl and mix together with hands until completely blended. In a saucepan combine ghee, almond butter, maple syrup over low heat just until it boils and is a smooth consistency. Add water and continue to stir. Take off heat and add vanilla. Pour into the fruit and nut mixture. Roll into balls and place on a cookie sheet covered with parchment paper. Meanwhile, melt chocolate chips in microwave for 1-2 minutes (be careful to check so it doesn’t burn)… After one minute, stir with a wooden spoon, microwave on high 30 sec. and stir again. Continue heating 30-second intervals until completely melted and smooth. Drizzle with a knife or small wooden spoon over each ball. Let the pan sit in a cool area for 1 hour until the chocolate hardens. Can be stored in a tin in a cool place or refrigerated. In the winter of 2011, a friend and I spontaneously arrived at a yoga retreat in Texas North country. It was a thrilling weekend of sleeping under the stars without a tent, outdoor yoga, hula-hooping, and, making new friends by the fireside. I also found myself descend into a ‘Cave Without a Name’, where a shaman-lead drum ceremony directed us on a journey to find our power animal. Sounds different, right? Of course, there was no denying what happened next. As I lay on the ground, deep in an ancient cave, hypnotized by the drumming, I experienced (I supposed, in my mind’s eye) a real journey. We were told that it was possible during this ceremony to find your ‘power animal’. This animal is the spirit ally and companion that has been with you since your birth – whether you know it or not- waiting for you to initiate contact again. A moth made contact with me. My reaction was, “I must have done this wrong. Who get’s a moth for a power animal?” I wanted an eagle, a lion, or perhaps even a wise old owl. I came out of the cave shaken by the experience that felt so profound. My conscious mind began to reason how silly I was to believe it. Moths are plentiful, during evenings, especially near windows and by lights; which is where I spotted this one. 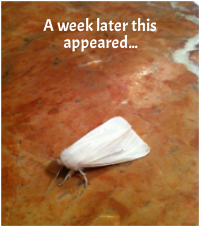 It was whiter than I had ever noticed a moth to be. I took this picture. I reflected on my shamanic moment. A few months later, this Luna moth was hanging right outside a cottage where my husband and I were staying while we were at a wedding in Vermont…the WHOLE weekend. It didn’t move, even when I tried to pet it. Hmmm…that’s another moth. During this time, I was in a state of discernment about how to use the years of herbal education I was deeply invested in. I knew I had found something that I was passionate about. The more I learned, the more I wanted share this knowledge. The only thing that came between creating a natural wellness practice and becoming an herbalist was my own self-doubt. In the meantime, my 87 year-old mother who lived alone in an apartment on our farm was complaining of feeling dizzy and unwell. She went to several doctors who found nothing wrong with her. On August 21, 2012, I came up my driveway and saw this white deer. Or at least, the whitest deer I have ever seen. As you can see, he even allowed me to take his picture. It is awesome when a wild animal stops and gazes at you. I felt there was a message. I read about a Native American Indian practice that when someone saw a white animal the whole tribe would stop whatever they were doing and have a ceremony to honor the sighting. To them it was a sign that there was a shift, a change about to happen. The day after this sighting, my mother was diagnosed with a brain tumor. She died 29 days later. A couple of years went by, and as I continued to study and create the practice I dreamt of, one thing was constant, self-doubt. I fabricated so many reasons why I was not able to manifest my dream. So the universe reminded me yet again. In the spring of 2014, my son had been working in Australia for about six months before looking for a job after college. His location was remote. We barely spoke due to the time difference. The WIFI connection he had was very unreliable. I got a videotext from him one day out of the blue. “Mom! Check out the size of the bugs here in Australia!” Click Here to watch the video. My son was completely unaware of the name I decided I would use for a wellness practice. I have no doubts any longer. For me, it took several years and lots of nudges from the universe to embrace the idea, and the name fully. There were many other ‘sightings’ and signs that I am moving in the right direction. I recognize that a moth is a perfect symbol for my work. In order to create wellness and manifest healing, a person can create change if they follow the moth journey. In it’s life, a moth seeks only light; which represents the knowledge needed to know how to heal our problems. The moth moves swiftly. In creating good new habits and healing ourselves we need to MOVE…sometimes quickly, sometimes gently. Movement is the key. And of course the peak of the moths life is when it transforms from a creature that crawls to a creature that flies. It can feel that way when we finally have the answers to heal ourselves. We can free ourselves of imbalance and pain in our bodies, and we can fly! Before my mother died, she gave all five of my brothers and sisters one or two envelopes of things she saved that were particular to each of us. I have looked at first drawings, cards, report cards, pictures, etc that were in my envelope over the years. I found myself looking at these treasures recently and I came upon something my mother saved. I was 6 or 7 years old and I apparently found this printed napkin the perfect gift for my father. I guess your power animal can be with you all of your life…you just have to notice.